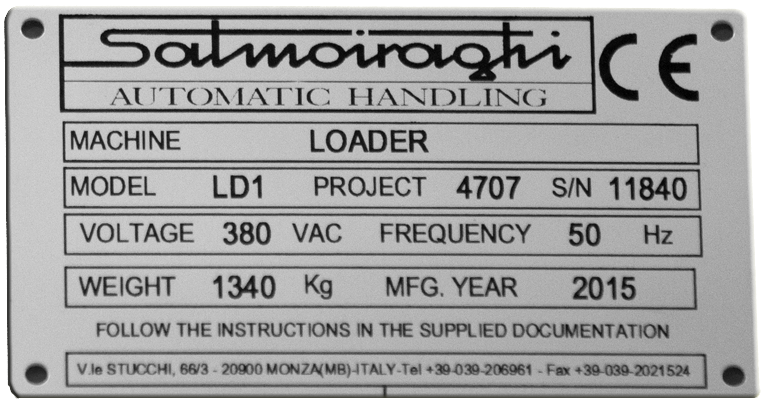 Salmoiraghi has always dedicated particular care to the Customer assistance and spare part supply aspects. The comprehensive and detailed documentation supplied with each system, including complete sets of mechanical drawings and electrical schematics, and the technical support available for the lifetime of the installation, allows us to supply assistance services and spare parts even for machinery that has been in operation for more than 25 years. To achieve these results and identify the correct components, we need the active collaboration of the Customer who must submit his requirement in a clear, correct, and complete way. The procedure consists of two steps. 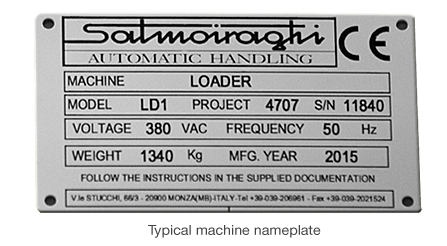 The first step is to clearly identify the relevant machine or device by means of the data indicated on the machine nameplate. This data consists of the Project (Job) Number, machine S/N (Serial Number) and Machine model. The second step is indicating the Part Ordering Code and Description of the requested spare parts. This information can be obtained from the supplied assembly drawings and spare part documentation. I hereby declare to have read and fully understood the Salmoiraghi S.p.A. information note, and authorise the processing of my personal data by checking the box below. to the processing of my personal data for the stated purposes indicated in the above mentioned information note.